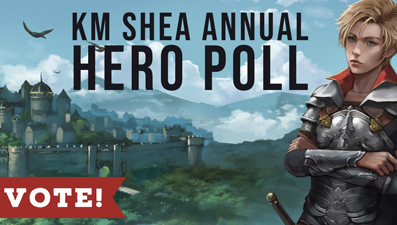 *Ding* *Ding* Time for Round 2 of my Annual Hero Polls! The Most Wanted Hero Poll! For those of you Champions who may be new, every year I hold a poll in two stages. The first is to crown the top voted heroes from my K. M. Shea and A. M. Sohma books. This year Merlin managed to maintain his title as last year’s winner – click here for the poll results. The second stage is to collect YOUR suggestions for the Most Wanted Hero and then vote on all of them! The suggestions were collected in the comments of this blog post, and there were a lot of great suggestions this year! I did my best to condense them when possible since it’s not really practical to have a poll with 50+ choices. Who will win this year? YOU DECIDE! Vote for your top five favorite hero archtypes below! I can’t promise I will definitely write a hero that matches the winner of this poll, but I do take the results into consideration when planning my future books! In fact, after Villain Turned Good Guy won the 2018 poll I decided to move forward with writing Royal Magic as Benjimir, the hero of the story, is a reformed villain. This poll closes April 5th, so you have until then to deliberate on your selection. Special note: The poll order changes with every refresh, so look carefully to make sure you haven’t missed any of your favorites! I know right! I was trying to figure who Stil would be because hes funny! I don’t like like there were so many good options to choose from. It was too difficult! Some of these traits totally remind me of Rhys from ACOTAR. I would LOVE another character like him in the world! Maybe I am just overlooking it, but where is the link for the current poll? The poll is just above this comments section. I think it would be interesting to have a poll without character types you’ve really done before like Mentor or overdone ones like Alpha Male. My favorites are Merlin and now Evariste. What if I have ten?!?!?!?!? These options are all so cool. I can’t wait to see which archtype will win! There are so many new inspired ideas this year. I think two of my favorite characters are Stil and Farren. Stil the street kid turned hero and Farren, villain turned hero. Loved those two guys!